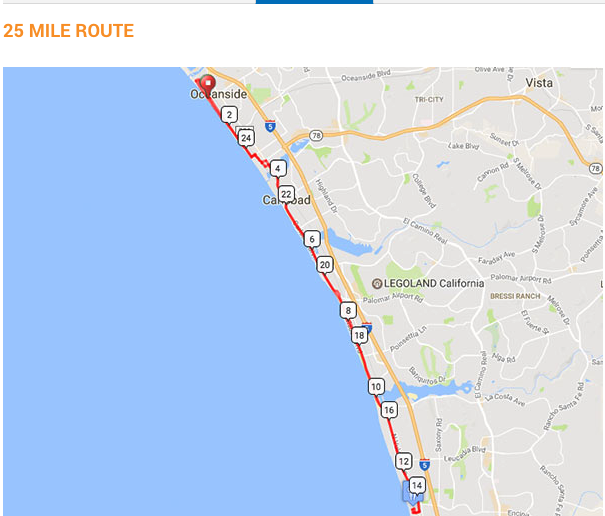 The 100-mile course for Bike the Coast – Taste the Coast starts at the Oceanside Pier and goes north to Breakwater Way before beginning a southbound trip to Encinitas. The 100-mile course is two loops of the 50-mile course. 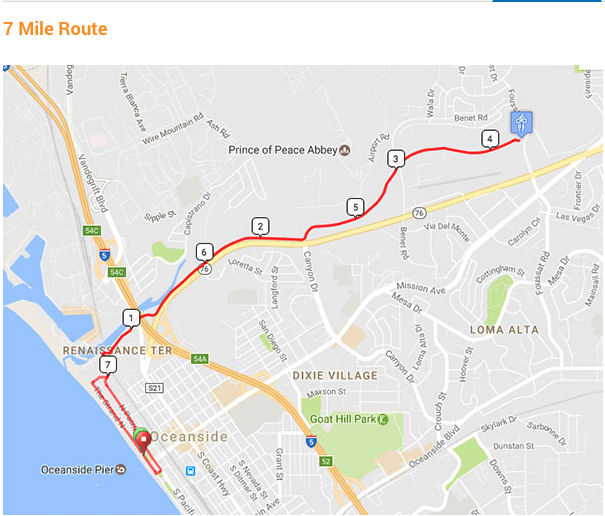 For 100 mile riders at the end of the first loop there will be an aid station just south of the Oceanside Pier at the Strand and Seagaze. 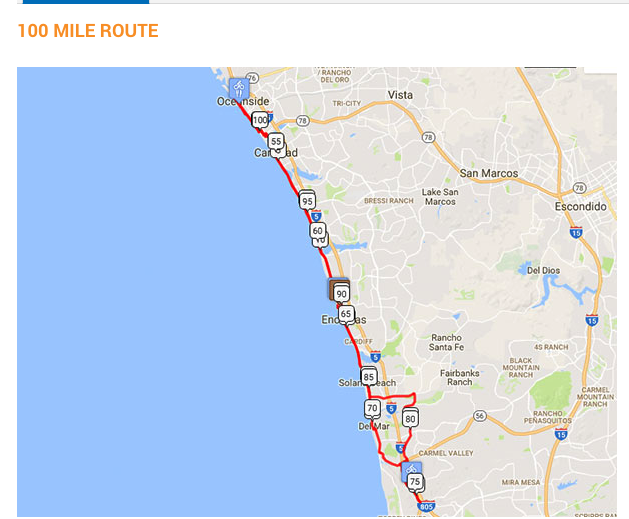 The 50-mile course for Bike the Coast – Taste the Coast starts at the Oceanside Pier and goes north to Breakwater Way before beginning a southbound trip to Encinitas. The course is well-supported, and perfect for your first, or most enjoyable coastal ride. 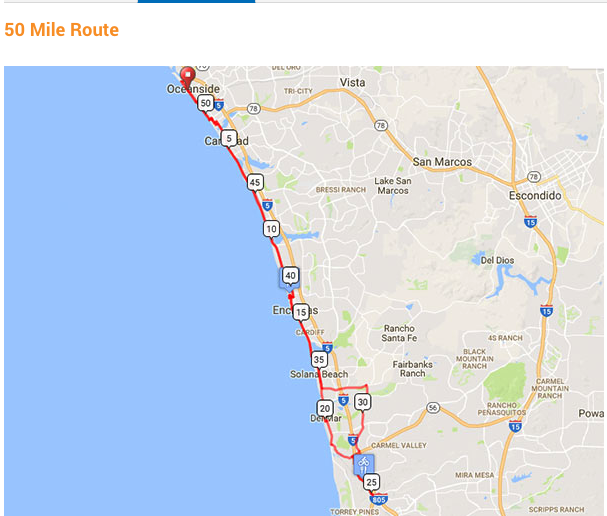 The route tours the beaches on Highway 101 through Oceanside, Carlsbad, Encinitas, Solana Beach and Del Mar. 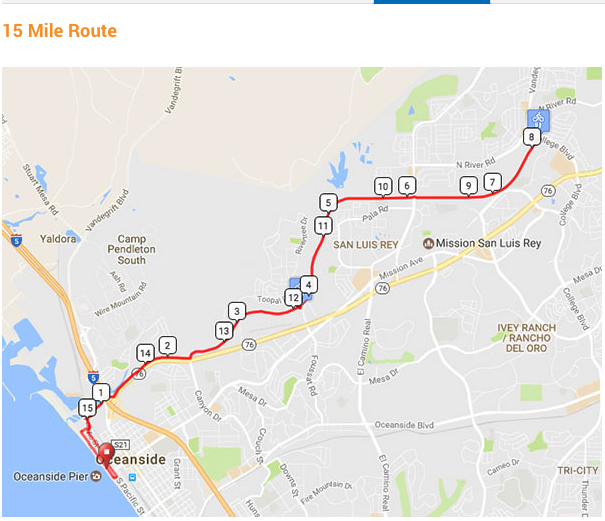 This is an out-and-back course with a turn-around and aid station on Sorrento Valley Road south of Del Mar. (approximately 24.2 miles from the Pier). There is also SAG support for all riders at the start/finish near the Oceanside Pier. The Taste the Coast Festival at the finish line will include a selection of local cuisine, music, a beer garden and a sports expo. Walk-Up Registrations: online registration closes at 11:59pm on Monday Oct. 28. If spots are still available, unregistered riders will be able to register outside the Bandshell near the Junior Seau Recreation Center on Friday Nov. 1 between 4:00pm-7pm, or at Betty’s Lot on Saturday Nov. 2 from 5:30am-9am. Before 6:30am – From NB or SB I-5, exit at Mission Blvd. and head west on Mission Ave cross Coast Highway (PCH/101). Check-In and Start are on the Strand, on the beach. After 7:00am – Traffic on Mission WB gets heavy and close-in parking (west of RR) gets slim. Try exiting at Harbor (from north) or Oceanside Blvd. (from south) and taking Pacific St. to either the Breakwater lots (#20 & 21) or the Myers lots (enter at Wisconsin). There is NO PARKING on the Strand for this event – please do not waste your time. NO PARKING IN RED CURBS! There is plenty of parking near the start and surrounding area. See map on this page that lists the public parking lots and fees. Lots 28, 29 and 30 are not available during the event. Recommend you do not park in lots or street parking with 2 hour limits so you can enjoy the after ride activities on the Strand. If parking on the streets ensure you note the parking hour limits. Lots 21, 22 and 27 are the lowest cost per all day lots and provides hundreds of spaces. Lots 23 and 36 are free all day as is the Civic Center Parking Structure and the Transit Center Parking Structure. Oceanside Transit Center (in garage building only – outside lots to the north are four-hour!! NCTCD lots to the south are all-day) – corner of Cleveland and Seagaze (east of RR tracks – Parking Structure on map) – (1/3 mile). On-street parking – mostly east of Coast Highway or south of Mission (1/2 mile – 1 mile). All-Day Pay Lots – Not expensive for beach parking. Please pay – they will ticket. BE CAREFUL – Four-Hour Lots – THEY ARE ENFORCED! On-street parking on Pacific near the Pier is metered with a four-hour maximum. Most of the lots EAST of the RR tracks and North / South of Mission (off Cleveland) are four-hour maximum (lots #23, 32 & 33). Four-hour lots cannot be “fed”. Avoid 4 hour lots unless you only plan on being here for four hours or less. Volunteers wanted! Head to the official event website for more info. Follow traffic laws: please do not be ticketed as Police and Sheriffs patrol this route. This is a bike ride, not a race, and is held on OPEN ROADS with motor vehicles. Riders agree to wear approved helmets while riding the bike in this event. All riders MUST have a bike number and wristband on the course for safety and access to SAG. We strongly suggest you bring at least TWO water bottles FULL of water/fluid as well as a cell phone. In consideration of your safety, do not wear earpieces in both ears during the ride. Public safety vehicles have the right-of-way at all times! Use the toilets provided at the SAG Stops only, please! If a rider is unable to continue, he/she should move to a safe place off the road and signal a race vehicle for assistance, or call the dispatcher number provided on the PDF, or on handouts on event day.